The flamingo’s bright pink color is due to its diet. The carotene from the shrimp in its diet turns its feathers pink. If a flamingo’s diet is low in carotene, the feathers become white. Flamingos have a very long neck and long, pink legs with big, pink, webbed feet. The eyes are orange. Adults grow to be about 4 feet (1.2 m) tall. Their long bill turns downward in the middle; it is yellow/orange with a black tip. The large bill is used in filter feeding. 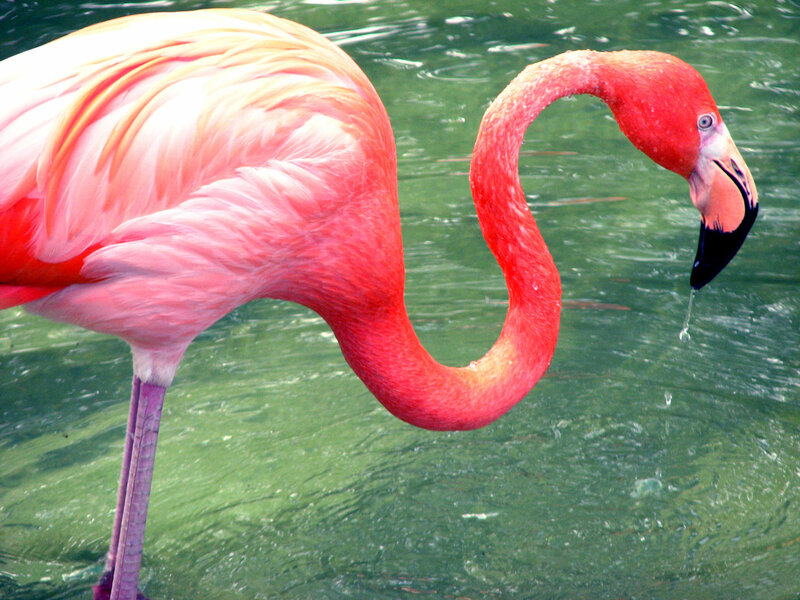 The flamingo eats insects, crustaceans (shrimp and other shrimp-like animals), and tiny plants like diatoms and algae. The flamingo eats by putting its head upside-down into the water looking backwards. It takes in water that is rich in tiny organisms and filters nutrients from the water with a comb-like organ on its tongue.